Follow the instructions on the cake mix to make eight regular and eight miniature cupcakes. Allow to cool completely before decorating. Use an offset spatula or flat utensil to spread all cupcakes with white icing. With a serrated knife, carefully carve the tops off of the sugar cones to make 1 1/2” long cones. Use black pearl candies/dragees to decorate the mini cupcakes with snowman-style “coal” eyes and smiles. Use an orange chocolate covered sunflower seed for each nose. Use a glop of frosting to attach each mini cupcake at a 90 degree angle onto a large cupcake. 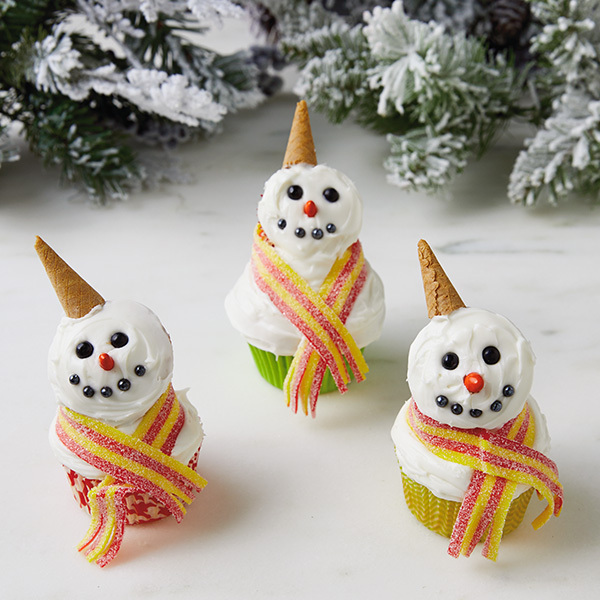 Use more frosting to attach a cone hat to each snowman. Cut sour candy strips into shorter lengths and fringe the ends. Wrap around the snowmen’s “necks” as scarves.